More than a century of chocolate making in Bristol was due to end on Thursday with the closure of the Elizabeth Shaw factory in Greenbank. 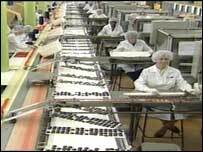 The Victorian factory was producing some 30 tonnes of chocolate each week, including the well-known mints. Now the 250 staff are to lose their jobs as the owners close it down. Bosses said the factory's equipment has become outmoded and is unable to cope with the demands of confectionery production in the 21st century. The original owners started the business in the 19th century with a paraffin lamp and three pans. Then, in 1901, the factory at Greenbank was opened, paying workers two and sixpence (12.5p) a week. In the future, Elizabeth Shaw chocolates will be produced abroad. "The original factory is too old to meet the demands of modern efficient production," said director, Paul Keith. The site will be sold off for re-development.